Hain Celestial Group Inc. (HAIN - Get Report) was upgraded today by TheStreet Quant Ratings service. We have not visited with the charts and indicators of HAIN in over a year, so this upgrade was a good opportunity to see what had transpired. Last year we said, "So we missed the boat on HAIN, what now? HAIN is extended on the upside, so new longs should try to enter on a shallow dip towards $50 if available. On the upside, there doesn't seem to be much resistance between here and $65." With hindsight we can see on the weekly chart (second chart below) that the rally carried to late July/early August of 2016 and then prices plunged to around $35. Over the past twelve months HAIN has been able to rebase and find new buyers. Let's see what things look like now. In this daily bar chart of HAIN, below, we can see that prices are testing the rising 50-day moving average line and remain above the rising 200-day line. Prices gap lower in February but that gap was filled by May. A decline in June below the February lows was reversed fairly quickly with heavy volume. In July prices broke out on the upside above the January highs and August brought a retest of the breakout zone ($40). The daily On-Balance-Volume (OBV) line stays in a relatively narrow band from September to early June. June sees a short, sharp decline followed by a strong move up to August. The Moving Average Convergence Divergence (MACD) oscillator has declined to the zero line but could soon cross to the upside for a fresh go long signal on this time frame. In this weekly bar chart of HAIN, below, we can see that declines below $35 have been bought. Prices are above the rising 40-week moving average line. The weekly OBV line turned lower in August but if prices rally into September we should see the line rise again. The trend-following Moving Average Convergence Divergence (MACD) oscillator moved above the zero line in July for an outright go long signal but the two averages that make up this indicator have begun to narrow. Maybe they will cross or maybe not. 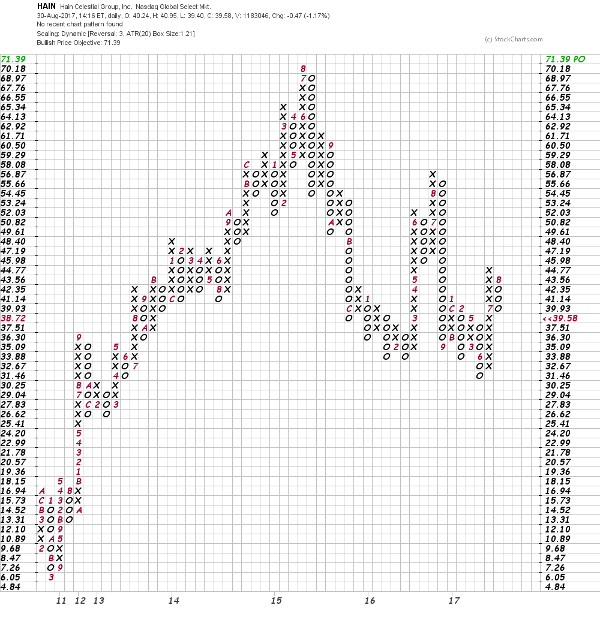 In this Point and Figure chart of HAIN, below, we can see a lopsided double bottom formation with an ambitious upside price objective of $71.39. Bottom line -- catching the next move in HAIN could be tricky. With the quantitative upgrade we want to favor the upside but we want the charts to work together so traders could go long HAIN on a close above $44 risking below $39. Click here to subscribe to Quant Ratings, where you can read our full report on HAIN or more than 4,000 other stocks that our service rates in real time every market day. However, please note that our Quant Ratings service assesses stocks using a proprietary computer model that runs a variety of factors through quantitative and technical analysis. Ratings do not necessarily reflect the opinions of Jim Cramer or other columnists, who may use different criteria to grade stocks.